Famed evangelist the Rev. Billy Graham passed away from natural causes this morning at his home in North Carolina. He was undoubtedly one of the most influential people, and certainly Christian figures, of all time. He influence extended around the globe and his platform allowed him to meet with world leaders from American presidents to Martin Luther King Jr. to Queen Elizabeth II. But at the heart of his ministry was his passion for the Gospel and his commitment to spreading this Good News around the world. He was known as "America's pastor." “An epic era of evangelical history has come to an end. Billy Graham was not only a titanic figure in evangelicalism, but in world history and perhaps represents the last of a kind. He dominated 20th century American evangelicalism and remained a major figure on the world stage throughout most of the 20th century in a way that we can envision no evangelical leader in our times," wrote Albert Mohler, the president of the Southern Baptist Theological Seminary, in an article titled "Mohler on Graham" 'An epic era of evangelical history has come to an end.'" 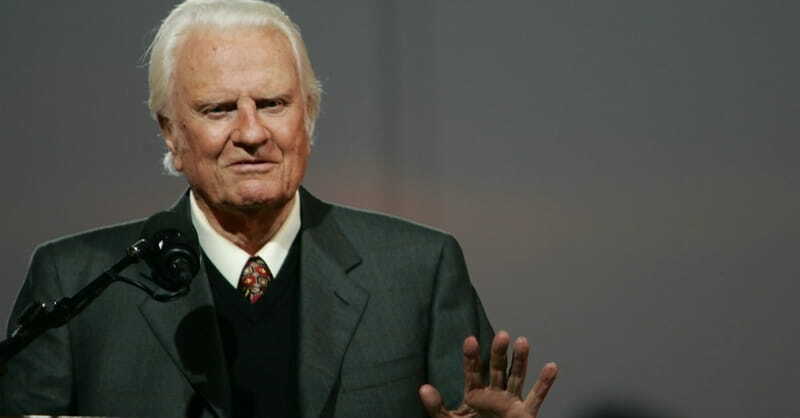 Thank you, Lord, for Billy Graham. There simply will never be another Billy Graham. What a gift of God to this world. Rev. Franklin Graham, Billy Graham's son, said the family grieves his death, but rejoices knowing he is with Jesus. The younger Graham's statement can be read here, as reported by CBN News. Photo: Billy Graham speaks during his Crusade at Flushing Meadows Corona Park June 24, 2005 in the Queens borough of New York. Flushing Meadows Corona Park is the site for Graham's sermons on June 24-26, which looks to draw thousands of people from across the country, and will purportedly be the aging Christian televangelist's final crusade.